Materials: Jasper, Jet and Burgandy chips. It contains 23.5K Gold Leaf with Quartz and Noble Shungite, Turquoise and Brass shavings; Features Moonstone and Opal. 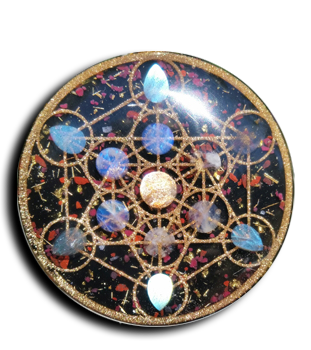 This pendant features a heart chakra geometry design with inlaid opal and Moonstone cabochon.